Jeff Wood, Texas man who didn’t kill anyone, receives stay of execution. 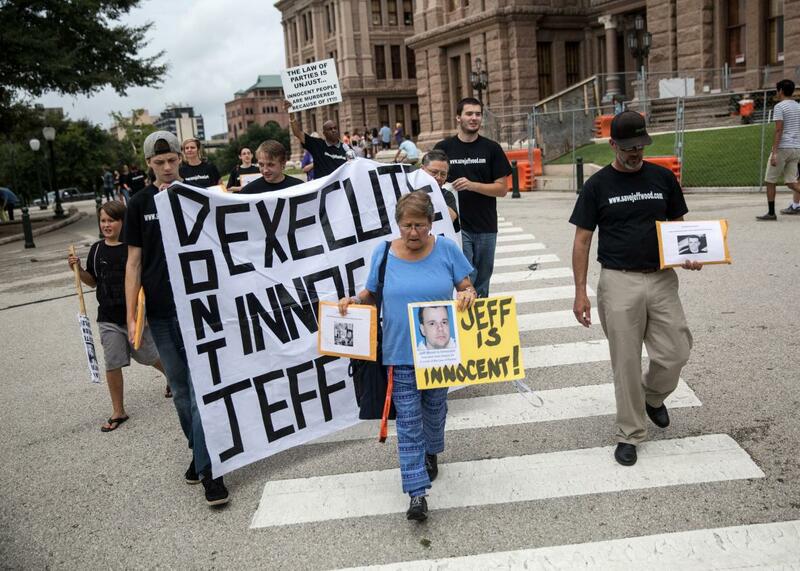 Family and friends of Jeff Wood and anti-death penalty activists march from the Texas State Capitol to deliver a petition Thursday with more than 10,000 signatures asking the governor and the Texas Board of Pardons and Paroles to commute Wood’s sentence. Jeff Wood, a Texas man who was set to be put to death on Wednesday despite never actually having killed anyone, was granted a stay of execution on Friday. The portion of the appeal that swayed the court related to the testimony of a controversial forensic psychiatrist named James Grigson and known as “Dr. Death.” Grigson testified that Wood would “most certainly” commit a violent crime again, but he never actually examined Wood. Cases where a person has been executed without having actually killed anyone themselves are incredibly rare: Only 10 executions out of more than 1,400 since the Supreme Court brought back the death penalty in 1976 involved people who did not directly kill anyone or hire someone to kill anyone. Texas Court of Criminal Appeals Judge Elsa Alcala, in a concurring opinion, argued that the lower court should reconsider the constitutionality of Texas’ death penalty in light of the fact that Wood had not actually carried out the killing and was set to be executed for it anyways. Alcala, a Republican and an appointee of former Republican Texas Gov. Rick Perry, argued that Wood did not meet the requirements for execution based on the landmark 1982 Supreme Court case Enmund v. Florida, nor the 1987 ruling Tison v. Arizona. I write separately because I would also remand claims five, six, and seven, in which applicant alleges that his participation in the offense and his moral culpability are too minimal to warrant the death penalty, that evolving standards of decency now prohibit the execution of a person who was convicted as a party to a capital offense, and, more generally, that Texas’s death-penalty scheme should be declared unconstitutional because it is arbitrary and fails to target the worst of the worst offenders, in violation of the Eighth Amendment. Alcala acknowledged that in the later Tison ruling, the court gave states the right to execute individuals “who did not actually kill and lacked any specific intent to kill,” but argued that even under this standard Wood should not be executed. Despite the court declining to rule that Wood’s involvement was minor enough to make his execution unconstitutional, his lawyer Tyler argued that this was in fact the case. Correction, August 22: This post originally referred to James Grigson as a psychologist.